So just about everything can be purchased online today but we don’t like to shop blindly. Because we can’t touch and feel what we’re purchasing online, we rely on reviews from people who have already tried the product to let us know what it’s like but not every review can be trusted, especially on Amazon. Fakespot is the web app that lets you know if those 5 stars are actually legit. If you’ve been around for a while, you may have noticed that there are defiantly some companies out there posting fake reviews to help boost their product or service. Sometimes they are laughably obvious, other times, not so much. 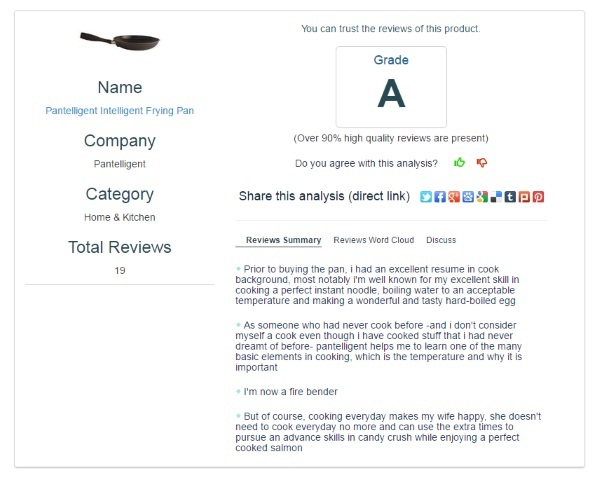 This site lets you see how trustworthy the reviews are by dropping in the link to the Amazon product in question and spitting out a grade. The higher the grade, the more trustworthy those reviews are as being real. The lower the grade, then, you might want to proceed with caution if you’re thinking of buying. If you’re just curious about the types of products that landed on the fake side, you can check those out as well. Fakespot is free to use and also has a Chrome extension for those heavy Amazon shoppers.